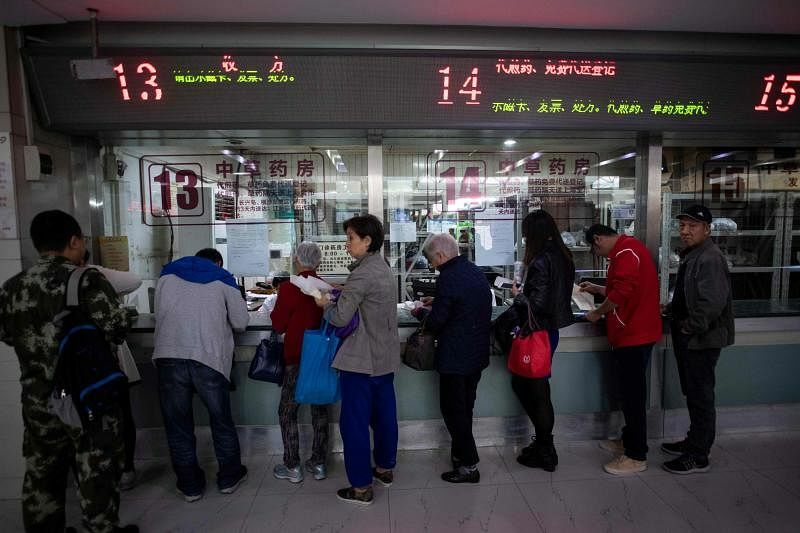 SHANGHAI (AFP) - A crowd gathers at a Shanghai hospital, queuing for remedies made with plant mixtures and animal parts including scorpions and freeze-dried millipedes - medicines that China hopes will find an audience overseas. With a history going back 2,400 years, traditional Chinese medicine (TCM) is deeply rooted in the country and remains popular despite access to Western pharmaceuticals. Now the authorities are hoping to modernise and export the remedies, but they face major obstacles. A veritable forest of medicinal plants surrounds patients waiting at Yueyang Hospital's pharmacy. Some leave with boxes of pills, others take away plastic sachets filled with herbal extracts. Mr Lin Hongguo, a 76-year-old pensioner, has bought herbal remedies that he will boil to make a tea to treat his "slow beating heart". "I prefer it to Western medicines. It's not about the cost, it's because it works well," he told AFP. Another patient, pet fish seller Wang Deyun, 51, is also a believer. "Two months ago, my skin had an allergic reaction to a modern medicine for high blood pressure," she said from her hospital bed. But after a treatment of face masks and plant infusions, she said, she is almost fully healed. Traditional medicine is subsidised in China and is cheaper than Western medicine. It consistently makes up one quarter of the country's pharmaceuticals market - even as China increasingly opens up to modern medicine. The World Health Organisation (WHO) will next year include a chapter on traditional medicine in its "International Classification of Diseases" - a tome of reference for medical trends and global health statistics. China hopes the WHO inclusion will spur global recognition of its traditional remedies as it seeks to export them. But Beijing still faces significant hurdles, not least the fact that TCM focuses on tailoring treatment to each individual, which means different people with the same condition can be prescribed different medicines and dosages. "It's like a painting; it's composed differently each time, while Western medicine is more similar to photography", with its standardised products, said Dr Wang Zhenyi, a proctologist at Yueyang Hospital. That is the crux of China's challenge in gaining overseas acceptance: Its traditional medicine is largely incompatible with modern clinical trials, which require an identical product to be tested on a large number of patients. As these medicines typically contain dozens of ingredients, understanding how they work together and proving their effectiveness is a complex task. Even within China, there have been public skirmishes over the efficacy of TCM, pitting its proponents against doctors who advocate evidence-based, peer-reviewed medicine. Conservationists also say growing demand for products like rhino horn and pangolin scales - which are used by some practitioners even though they have no proven medical properties - have decimated vulnerable species. China partially lifted a ban on trading tiger bones and rhino horns last month despite warnings from conservationists, though state media later quoted an official as saying the change had been postponed. Chinese experts say endangered animal parts are increasingly being replaced by synthetic versions, but TCM may still prove a tough sell abroad. "I think the best potential is in the consumer market, such as nutritional supplements," said Mr Tony Ren, a pharma analyst with Kim Eng Securities in Hong Kong. Few Western pharmaceutical companies are keen to try to untangle these difficulties. But French biotech company Pharnext has taken on the challenge, partnering last year with Tasly, one of China's biggest producers of traditional medicines. Together, they are looking to transform the industry by streamlining "the procedures to have a more stable production of plants which have identical properties and understand why the mixture works", said Mr Daniel Cohen, founder and chief executive of Pharnext. The two companies are using artificial intelligence to understand how the medicines work as they look to standardise them, he added. They face an uphill battle. In the United States, Tasly has been trying for more than 20 years to get approval for Dantonic, an angina medicine based on sage and ginseng that was legalised in China in 1993. Though the firm has completed medical trials, it has come up hard against US law, which does not allow treatments composed of different plants. But Chinese medical professionals still feel the quest for acceptance abroad is worth the effort. "Medicine is still a very young science, with many unknowns. You increase your ability to heal if you know both Western and Chinese medicine," said Dr Wang of Yueyang hospital. "It's the result that counts."